Moscow State Institute of International Relations (Russian: Московский государственный институт международных отношений (Университет) МИД России, often abbreviated as MGIMO University, MGIMO (МГИМО)) is an academic institution run by the Ministry of Foreign Affairs of Russia, which is widely considered the most elite university in Russia. It was dubbed the "Harvard of Russia" by Henry Kissinger, because it educates so many of Russia's political, economic, and intellectual elite. Currently, it has the lowest acceptance rate and the highest test scores of any university in the country. MGIMO is one of the leading Russian universities that offers numerous educational programs in 18 key fields of study, including: international relations, international economic relations, regional studies, international law, political science, public and business administration, journalism, public relations, commerce and transnational business. MGIMO is the only university in the world listed in the Guinness Book of Records – it is named the only educational establishment teaching 53 foreign languages full-time. The University structure comprises two campuses, ten faculties and three institutes. Each year about 8,000 students from Russia and abroad study at MGIMO University. MGIMO was founded on 14 October 1944 by a special decree of the Soviet Government on the basis of the recently established School of International Relations of the Lomonosov Moscow State University. The first 200 students were veterans who had survived in the Second World War and were determined to build international peace and stability. By early 1950s, MGIMO comprised three schools, since its ancestor, the School of History and International Relations was added by the School of International Law and the School of International Economic Relations. In 1954 the Moscow Institute of Oriental Studies, one of the oldest Russian institutes and the successor of the Lazarev Institute of Oriental Languages created in 1815, was integrated into MGIMO. In 1958, MGIMO incorporated one more university — of Foreign Trade — and became the national leader of education and expertise in International Relations. In 1969 the School of Journalism and the School of Law were added to the scope of education and research fields. In the second half of 1980s MGIMO became a fully open institution. In 1989, admission on a commercial basis started and first students from Western countries began to arrive. In the late 1980s, MGIMO became the first national university to establish its own business school that later in 2012 emerged as the School of Business and International Proficiency. 1992 saw the creation of the School of International Business and Business Administration. In 1994 MGIMO was granted University status but traditionally contains the word institute in its name. The same year saw the creation of the International Institute of Administration. The same year a Department of Politics was introduced within the School of International Relations and evolved into the separate School of Political Science in 1998. The next decade saw the further buildup of reforms and improvement of educational quality, including newly opened schools and Master programs with the number of partnering universities abroad. In 2000, two educational divisions were established - Institute of Energy Policy and Diplomacy and School of Applied Economics and Commerce. In 2005, the European Studies Institute was opened on MGIMO basis. In 2011, the Institute for Foreign Economic Relations was transformed into the School of Applied Economics and Commerce. In 2013 The School of Governance and Global Affairs was launched as the first Russian school to train international students in English at Bachelor’s level. In 2016, MGIMO officially opened the Odintsovo Branch – its first Campus located in the prestigious Moscow suburban area. The Campus is also a home for MGIMO Gorchakov Lyceum. In 2017, the International Institute of Administration and the School of Political Science merged into the School of Governance and Politics. In 2016, MGIMO ranked first in the world in QS Graduate Employability Rankings - "Employment within a year after graduation". MGIMO lists 350th in the world (and 5th in Russia), leaving behind many leading foreign universities, including the University. J. Washington, American University, Paris Descartes University and University of Kent. Best Managed Think Tanks – 78th place. Today MGIMO comprises two campuses, eight main schools, three institutes and one business school. MGIMO became one of the first Russian universities to establish their own business school. Nowadays all MGIMO School of Business and International Competencies programs conform to the Association of MBA’s standards. MGIMO as well has 12 corporate departments designed in cooperation with different Russian companie such as an integrated oil company Rosneft, is a state-owned transport monopoly JSC Transneft, the third largest bank in Russia Gazprombank, JSC Russian Railways, The Federal Antimonopoly Service of Russia and others. A key priority of MGIMO international policy is the development of bilateral and multilateral international relations, and the promotion of educational and scientific exchange. Cooperation agreements with more than 170 foreign partners from 57 countries – universities, diplomatic academies, institutes, and research centers – help to ensure the highest global standards in educational and research work. The University is focused on mutual Bachelor and Master degree educational programs which comply with the Bologna process. In 2017 MGIMO had 22 dual degree programs with universities of France, Spain, Italy, Switzerland, Sweden, Norway, UK, Germany and China. Among MGIMO academic staff are approximately 900 professors holding PhD degree, as well as two dozen members of the Russian Academy of Sciences. MGIMO has granted honorary doctorate degrees to prominent foreign politicians, public experts, diplomats and scholars, working in the field of international relations and foreign policy among which President of France (2007-2012) Nikolas Sarkozy, President of the European Commission (1999-2004) Romano Prodi, President of the French Institute of International Affairs Thierry de Montbrial, Prince of Monaco Albert II, President of Chile Veronica Michelle Bachelet Jeria and many others. The Institute of International Studies which comprises 12 research centers accumulates the scientific and intellectual output of the University. A special place occupies ASEAN Centre that was officially opened in 2010. The Center’s mission is to spread information about the ASEAN-Russia dialogue partnership, to facilitate development of economic linkages, cultural, scientific and educational exchanges as well as people-to-people contacts between Russia and the ASEAN member countries, to carry out and support research on problems of ASEAN and its individual members. MGIMO actively contributes to the Russian Political Science Association, the United Nations Association of Russia (RISA), a number of Russian foundations and non-governmental organizations, as well as to leading global think tanks. MGIMO University is the founding member of the Russian International Studies Association. RISA is one of the most dynamic national associations dealing with international relations studies and a member of the International Studies Association (ISA). The goal of RISA is to preserve and develop the best traditions of interdisciplinary research and teaching in the sphere of international relations. RISA pursues the aim of maintaining a high professional level of research and teaching of international relations and world politics in Russia, as well as extending the network of professional contacts with foreign associations and establishing close ties between researchers and educators. The President of RISA is Anatoly Torkunov, Rector of MGIMO-University, Full Member of the Russian Academy of Sciences. RISA conventions are held on a regular basis, publication of participants’ reports and articles following up. RISA is also an organizer of a series of international consortia, conferences, scientific and educational seminars and round tables. MGIMO currently teaches 53 languages; a Guinness World Record. MGIMO Alumni community amounts to 40 000 persons including 5 500 foreign citizens. In 1991 MGIMO Alumni Association was founded to support the community of MGIMO graduates. The Association comprises more than 8 000 members and consolidates 25 alumni clubs abroad. In 2006, the MGIMO Board of Trustees was established with Sergey Lavrov, Minister of Foreign Affairs, as its Chairman. The Trustees are Russian high-ranking officials and prominent public figures, mostly MGIMO alumni, as well as Russian and foreign leaders of business and philanthropic community (such as Ingvar Kamprad, the IKEA founder, and Frederik Paulsen, Chairman of the Board of Directors of “Ferring Pharmaceuticals”, Honorary Consul of the Russian Federation in Lausanne). A year later, the MGIMO Board of Trustees established the Russia’s first university Endowment designed to secure the long-term financial standing of the University. Hang Chuon Naron, Minister of Education of Cambodia. Yuri Ushakov, Aide to the President of the Russian Federation. Famous business personalities in Russia, who studied at MGIMO, include billionaires Alisher Usmanov, Patokh Chodiev and Vladimir Potanin. For more information see also List of MGIMO alumni. ^ Müller, Martin (2009). Making great power identities in Russia: an ethnographic discourse analysis of education at a Russian elite university. Zürich: LIT. ISBN 978-3643900104. "Moscow State Institute of International Relations ." Moscow State Institute of International Relations (University) of the MFA of Russia. N.p., 2010. Web. 15 Oct. 2010. 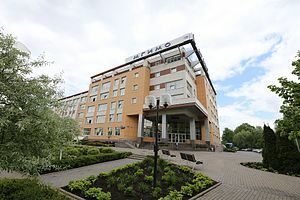 Wikimedia Commons has media related to MGIMO.